It simply is squirrel proof, in my opinion. We are very satisfied with this product and will shop your site again. The birds get in, the squirrels don't. Just as advertised! 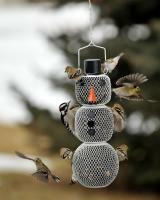 I like this bird feeder very much. It accomplished exactly what I wanted by keeping the squirrels on the ground! It really is squirrel proof. 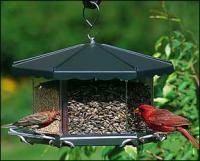 This feeder is aptly named. Squirrels try and try but cannot outwit the clever design. 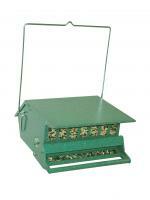 It may not be the most beautiful feeder around, but it will save you big money on bird seed. The mechanism can be adjusted to allow the heavier birds but not a squirrel. We bought an extra one for my mother-in-law. Highly recommended! It is great! The squirrels can not figure how to get in it. The birds had one in our previous house and it worked very well. The metal perch is very slick and birds are constantly slipping... does not prevent large birds from feeding (Jays etc) and single side access limits the number of birds at the feeder to 3 or so... clinging birds are reduced to pecking seeds out of the mounting holes in the sides.